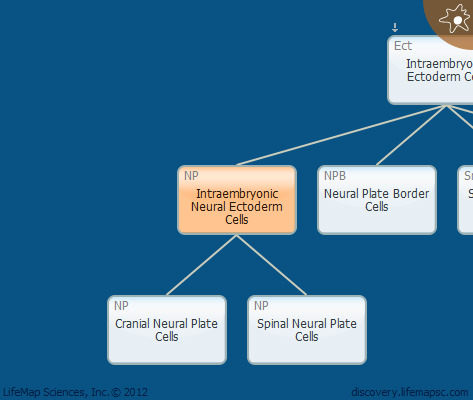 The intraembryonic neural ectoderm cells give rise to the neural fate. The induction of the anterior neural fate occurs shortly before gastrulation and the earliest signals arise from the anterior visceral endoderm (AVE) and node precursors. In early gastrulation, the node maintains the anterior neural identity (prospective prosencephalon) in the anterior epiblast. As gastrulation proceeds, the specified anterior neural cells migrate anteriorly where they become juxtaposed with the AVE that prevents the anterior neural tissue from acquiring posterior character. In the late gastrulation stage, the prechordal plate, a node derivative, migrates anteriorly from the node to underlay the midline of the anterior neural plate and maintains anterior neural identity. The more posterior types of the neural tissue, midbrain, hindbrain and spinal cord are induced by the notochord. The induction of the ectoderm cells to the neural fate occurs shortly before the formation of the neural plate.